It may not be a flatscreen, but it still looks great and the pictures are fantastic. Bid a fond farewell to rear-projection. With JVC recently announcing that it's following Sony out of the rear-projection market once its current range expires (later this year), the massive 65DS8 could well be the last RPTV to grace our Tech labs. I for one will mourn their passing. Today's rear-pro TVs are an interesting high-performance alternative to flatpanels, and this set certainly wins design points. It looks as slim as a 65in rear-pro set ever could, with a tiny 1cm wide bezel and surprisingly shallow 29.5cm depth. 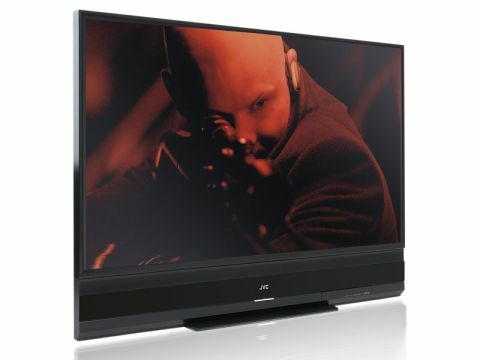 The 65DS8 employs JVC's own DILA projection technology, delivering a Full HD resolution and claimed contrast ratio of 10,000:1. Considering its size, this is a surprisingly affordable TV. The tiny bezel means it looks suitably stylish, at least when viewed front on. Many aspects of its performance are outstanding. HD images are sharp and detailed, while black levels are so deep they leave rival bigscreen LCD products weeping in the dark. Colour fidelity is good too, with natural skin tones and fulsome saturations. There's no loss of detail in fast-moving scenes, either, making these great for sport. There are some visual artefacts to consider. HD pictures may suffer a little dot crawl, while standard-def images can look slightly blocky. Brightness doesn't always seem entirely uniform across the screen and the image sometimes flickers, especially with bright edges. The screen cannot handle 1080p24 video feeds - this will be a concern for Blu-ray fans. Do you really want to be the only guy on your street with a 30cm-thick TV?